Planet Hell: Final Fantasy challenge. Thought I'd post some more on this. Basically what I am attempting is to beat all the Final Fantasy games I haven't beaten before FFXIII comes out. Now that there is an actual release date set for XIII, this puts quite a time constraint on my quest. I thought I would have a lot more time to do this, as the release date is earlier than I had expected, for sure. March 9th 2010 is when it will allegedly hit North America and Europe. While that is good news, I had thought it would be a lot longer than that. Now I have only a few months to try and beat the rest of my unbeaten Final Fantasy games, because I don't really want to start XIII before I've beaten the preceding games. *Sigh* I might have to though, as I'll really want to play it soon after it is released. Anyway, I just beat Final Fantasy V Advance yesterday and quite liked the ending. The endgame was not too hard, apart from the "optional bosses" Omega and Shinryu, which there was no chance of me beating. Surprisingly though, I managed to walk the end boss, not even one character died from what I can remember. I had mastered quite a lot of the classes by the end, so my party set up looked like this. I just put them as Freelancers for the last fight, you can make some very broken setups with it if you have stuff mastered and good gear to give em. Excalibur, Sasuke's Katana, Ribbon, Black Garb, Protect Ring. [Rapid Fire] ~ This is crazy, especially duel wielding weapons. 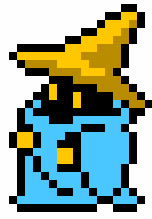 Anyway, I quite liked the class system in FFV, thats one of the things that kept me interested. Towards the end of the game I started to get quite gripped as the enemies started to get tougher. The ending was quite cool actually. Not my favourite FF game, I thought I'd like it more because i had heard good things about the class system, I mean I liked it but some things felt slightly weak. In places it seemed a bit glitchy, but that might have been due to my SP and DS phat being old...the re-equipping or unequipping all when abilities or jobs are changed was really annoying and there was no way to turn it off. The fact that you couldnt see your max HP, or your MP at all in battle without going into a few menus was really stupid I thought also. Little things like that could have been improved and I'm guessing they would be if they ever released another remake, for the DS for example. I'm not sure they ever will. Anyway, its a decent enough game, I think I would give it 3 or 3.5/5. Think it will get 3/4 on backloggery. Check it out, especially if you liked the class system in FFIII or any of the other games. So that brings my beaten list up a bit more. I've decided not to include FFX-2 or FFXI (because I have no way of playing the online game unless I shell out for Xbox Live) in my challenge, so here is how it looks now. 6/11 beaten! will I get there by March? I am doubtful.